For their extruder, i have looked at the data sheet on the duet wifi wiring diagram and cant seem to get the correct pin out to get this motor moving. As of now it just studders when i sent it a command. Any help and I would be super grateful as at this point I am so lost. I used this motor with the cable supplied and it worked fine. A stuttering motor can be a sign of bad wiring especially in a connector. If you want to check a motor's wiring it's fairly simple. Get a multimeter and attach it to any 2 of the motor wires, is there resistance or open circuit? If there is resistance they are a pair, if not unclip one wire and try another. The other two wires are the other pair. Wire one pair to one "side" of the 4 pin motor plug, wire the other pair to the other "side". Motor direction is determined by which way around the plug is inserted, which is why I would not use Molex plugs for motors, use DuPont plugs, they do not need to be polarised. If the motor is just jittering then one pair is not connected. Check the plug, maybe crimp a new one on. Intermittent connections are a potential cause of blown driver chips, and as someone else here recently experienced, possibly blown motors too. True, I find the ones I use are actually rather too tight, but then as you say they are quite variable..
How do I tell what is A1 and B1 is that negative or positive? Not sure what a1and b1 are? If you mean the polarity within each coil/pair of wires it doesn't matter. It's just a case of connecting one coil to pins 1,2 and one coil to pins 3,4. 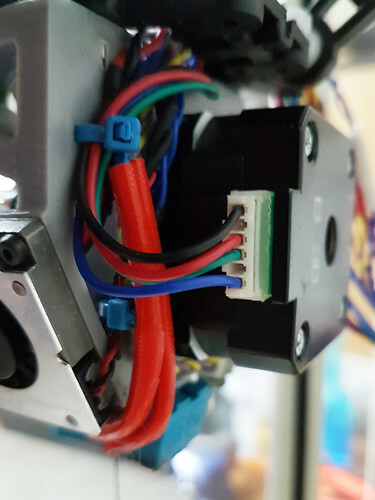 As Doug says if you chose to use molex connectors then you might need to change the drive direction for that motor in firmware. If you use dupont just turn the connector around. This is what I am going off of so I am kinda lost on what the pairs are. the Letters or the numbers. so far none of the combinations have worked is there a way I can test the the motor off the board? First, check the motor. You should see about 2 ohms between blue and red. You should also see two ohms between green and black. Next up, matching the wire colors to the colors in the screenshot you posted should do gainer, since blue/red is a pair and green/black is a pair. What command are you sending? What accelerations are you using? You may be trying to accelerate the motors faster than is possible. Would be good if you could post your config.g. Have you tried a different motor connected to that motor output on the Duet, or that motor connected to a different motor output, in case the problem is a faulty driver? Maybe also try 16X micro stepping instead of 64X (but don't forget to divide your steps per mm by 4)? Dunno - just a long shot. That motor requires a really high current to get it to move. Try between 1200 - 1400ma, going off of memory. I ran it at 1200, but didn't care for it as the connector could come loose. It never popped off while printing, but was well on its way there a couple times, and I didn't want it to pop loose and kill a driver. no good, any there suggestions? is there a way I can skip E0 and use E1? Yes, put M584 E4 in your config.g file, earlier than the M906 command. Probably not helpful, but if that E3D motor is a lot of trouble consider this one https://www.omc-stepperonline.com/hybrid-stepper-motor/nema-17-bipolar-18deg-13ncm-184ozin-1a-35v-42x42x20mm-4-wires-17hs08-1004s.html instead it's only $6.60, its 13 Ncm but smaller size and I drive it at 650mA with titan extruders, yes its 1.8 degrees but running a geared extruder 0.9 degrees is overkill plus needs to be bigger to achieve the same torque (and apparently uses more than double the current!). Hello Sharpie, I run it at 900ma with x16 microstepping and seems to perform well. Are you testing it alone or already assembled with the extruder? Maybe the gears are not aligned and that's why it stalls. Long shot, but worth asking. But at least we are online.